Deshi, deshi, basara, basara! Remember it? That's arabic and means "Ben, Ben, Affleck, Affleck!" Anyway, with The Drak Knight Rises, Nolan concluded his triology and so we've seen the last Batsuit before the re-boot. And it was good, wasn't it? 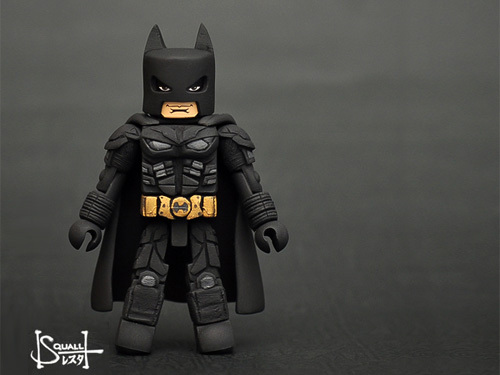 Les Koting aka Squall used his magical sculpting abbilities and customized this fantastic Dark Knight Rises Batman Minimate. And it is glorious. Isn't it? You can few a lot more pics and see what this custom is based on right after the jump. would you be willing to commission another one of these? Bob is having a closer look at custom minimate creations by customizers from all over the interwebs. Marvel, DC, Indie Comics, Cartoons, TV-Series, Movies, Video Games. You name it. Oh, and he's a customizer himself. Here's all his stuff.